Working closely with wood as we do and regularly building projects from raw materials, it is imperative that we understand the uses and applications of modern paint finishes. We have huge experience with all types of wood finishes such as varnishes, stains and wood dyes. 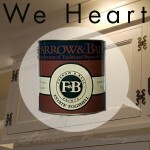 We also regularly Farrow & Ball paints and colouring for their professional, long lasting and contemporary finish.